Today I am playing along with thew new Ellen Hutson, Essentials By Ellen Pin-Sights Challenge! The Essentials by Ellen Pin-Sights challenge is a montly inspirational challenge based on a Pinterest inspired photo, which can be found on the CLASSroom blog. You can find this months challenge on the CLASSroom blog HERE. Here is the card I created based on the Pinterest photo inspiration. I used all the Bold Blooms sets on this card. I added some of the new Stick It adhesive sheets to white card stock then die cut the bold blooms flowers and leaves. I then added gold and black glitter over top of the adhesive to create glittery die cuts. I used the coordinating dies for the bold blooms stamps to cut some cream card stock to layer behind the flowers. 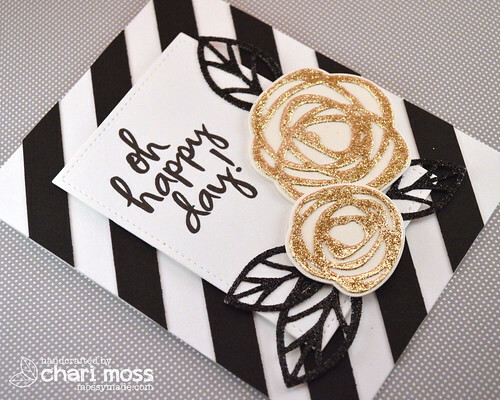 To create the background I cut strips of black cardstock then arranged them diagonally across my card base. This look tedious but was actually very easy. I arranged the strips on my grid mat then used two pieces of low tack tape to hold them in that position while I applied glue then placed them on the card base. Then I simply used scissors to trim off the edges. Come play along in the CLASSroom! One random challenge participant will recieve a $50 gift certificate to the Ellen Hutson store. To be eligible please use Essentials by Ellen produts and use the pinterest photo for inspiration. You can link up your projects on the challenge post HERE by March 31st to play along. I am not able to see the inspiration card though, the link goes nowhere for me. 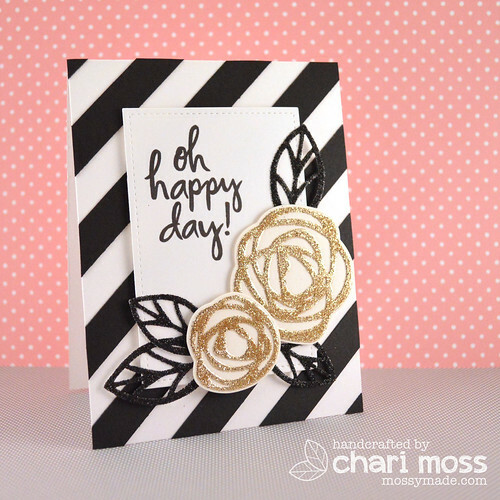 This is a fantastic take on the inspiration piece, Chari. So perfectly CAS. Love it.